Developing a watch that captures the fascination of soccer and the élan of the Swiss national team is both an enormous challenge and a huge opportunity. 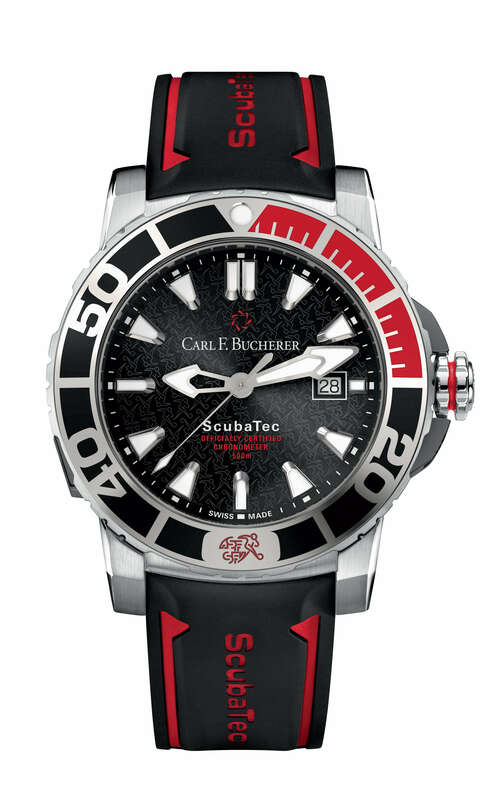 With part of the proceeds from the sale of this watch, Carl F. Bucherer will finance an entirely new kind of scientific expedition, during which data will be gathered that will help to protect the habitat of the manta rays. The Patravi ScubaTec is the perfect starting point. Its striking shape, rugged case and advanced functionality make it the ideal choice for sporting achievement at the highest level, and thus a symbol of the team spirit of the 50-strong Swiss national football team. The first surprise comes with the jet-black dial and its engraving of a group of players who only become clearly visible when we take a closer look. A four-millimeter-thick sapphire glass spanning the entire display provides the protection necessary for extreme conditions. The bezel features high-resistance ceramic inlays in the colors of the national team together with its logo at the 6 o’clock position.